A supported week of nourishment for mama and child. 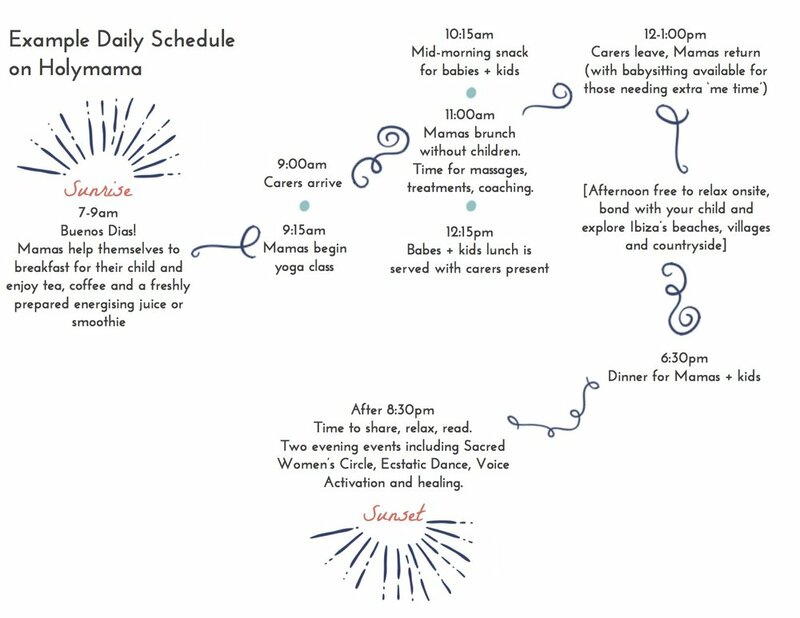 An intimate HolyMama Retreat during the school holidays. Older children are very welcome. At a specially selected house in Ibiza, this retreat is designed for a small group of Mamas who need TLC, support and time out. With HolyMamaLove we are planting a new seed in the way we support women and children. This retreat will include some low-cost sponsored spaces for women who are struggling financially and have experienced a form of abuse in their relationships (this can be from parents, not just partners). We will work on rewiring patterning and conditioning that is keeping us in cycles of the victim-perpetrator mindset and other imprints of suffering. We are cross-subsidizing this retreat via mothers who can afford to pay in full and HolyMamaHub, our new online membership which launches in March Like everything we have done at HolyMama we are nurturing HolyMamaLove to grow organically. We are weaving and co-creating with others who share our vision. If you are one of them please reach out to us via admin@holymama.info. Our bigger vision is that we take HolyMama Love into refugee camps, orphanages and shelters. We are happy to hear from anyone who is aligned with this vision. We dream of seeing retreats to uplift women in worn-torn countries like the Congo or Liberia. We envisage paying legal fees for women who can’t afford them in places like Nepal and offer leadership mentoring for women starting their own business in places like Afghanistan. Our mission is to enable women and children and continue creating safe and sacred enclaves around the globe. Our mission is to connect and celebrate each other. Our venue of choice is Can Fornás. A 400 year old traditional country farmhouse in the Es Fornas Valley. The house has been maintained without affecting the original structure or the surrounding nature. Its facilities include an ancient pirate tower, originally built to protect local farmers from Barbary pirates 400 years ago and where one of the rooms is now located, which adds even more charm to this small treasure of Ibizan architecture. The venue does not have a pool, but the beautiful beaches of Ibiza are a short drive away. 6 nights/7 days accommodation in Can Fornás - a 400 year old traditional country farmhouse in the Es Fornas Valley for you and your child/ children. If you want to bring a second child this is generally an extra 350 Euros to cover extra childcare, food, sleeping arrangements. Check-in is after 1400 and check-out is 11000 on Saturday. There is no fixed schedule for Sunday to allow for rest after travel.